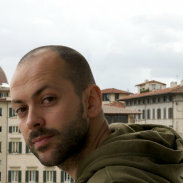 Mattia Sullini, from 22A|22, a Coworking space in Florence, will be a speaker at our Coworking Europe conference. 22A|22 is a member of the Italy based Cowo Project, likely one of the largest coworking network in Europe. I am 33. I live in Florence. I work as a freelance 3D visualization artist, back since 2001. My usual work goes from the visualization of interiors, to the industrial design, to the environmental simulations of projected buildings. During my 10 years freelancing, I learned how harsh the life of an independent was, expecially in a crowded area such as architectural visualization (moreover in a country like Italy where there is a very unfavorable ratio between fees and expenses). Two years ago, with Pierpaolo Taddei, a friend designer, we started to look for a place where we could share expenses. Soon, though, we realized that it wasn’t enough. Many other young professionals were seeking for an unexpensive, stimulating working environment. We found that the solution had a name: coworking. Florence is a city full of creative professionals. However, there is a total lack of cooperation between them. One year ago, we restored an ex-workshop with the aim to give an answer to such needs. 22A|22 was born. Today, besides its role as a coworking space, 22A|22 is a place where people can organise events and where creative professionals share their experience. The CoWo project is likely the largest Coworking network in Italy. CoWo has at least 40 affiliated spaces in the country. As WebWorkerDaily has recently noticed, the European scene on coworking seems to be as interesting as the North American one, were coworking was born. In this respect, we have received an invitation that gave us a great pleasure, for two reasons: one, for having the possibility to be part of an important event, two, for the general interest that coworking is raising (only two years ago, in the first days of Cowo, such a thing would have been totally unthinkable). Thank you Massimo and others for this support. We look forward to meet the CoWo people in Brussels, next November.